Platinum-topped and 18-karat gold Edwardian diamond and emerald tiara, circa 1910. Diamonds, pearls and other gemstones chosen by the bride and groom to wear on their special day can be the stuff of fairy tales. Many of these designs have a strong historic connection to notable collections from the past. Those original over-the-top selections are transformed by simpler, more affordable modifications, and passed down as classic choices for today’s brides through old photographs, television, and film. The same is true when highly publicized auctions of important pieces feature archival photos of the original owners wearing their celebrated baubles. Comparable, beautiful, and sophisticated items in your estate case can be as popular now as they were generations ago. The royal families of the world have long espoused the spirit of the old saying, ‚ÄòSomething old, something new, something borrowed, something blue.‚Äô This adage can be a valuable incentive to help encourage sales. Kate Middleton. Blue sapphire. Need I say more? Okay, how about sapphire and diamonds. The powerful resurgence of the comfort of that familiar style, even nearly 30 years after the original ring came to fame, is astonishing. The intervening years haven‚Äôt diminished the influence of this icon of international proportions, and the design is on target for a host of copies and imitations to fill bridal cases everywhere. A few generations back, Prince William‚Äôs ancestor, Queen Victoria, was a trendsetter-extraordinaire. Her introduction of the white wedding gown has had a lasting impact on brides to this day. During the Victorian era, coloured wedding gowns were the fashion and engagement rings consisted of the bride‚Äôs birthstone. Victoria bucked the previous trends with her choice of a pale gown and a snake motif ring signifying eternity, which was designed by the love of her life, Prince Albert. A modern bride could interpret this idea by wearing an antique serpent necklace set with garnets. Her great-great-granddaughter, the Queen, is no slouch when it comes to jewellery, whether it‚Äôs the Crown Jewels or personal pieces, like ‚ÄòGranny‚Äôs Chips,‚Äô a brooch set with a 62-carat square-cut diamond atop a 92-carat pear-shaped stone cut from the famed Cullinan diamond. Wedding presents from her jewellery-obsessed grandmother, the former Princess May of Teck, who reigned as Queen Mary alongside King George V in the 1890s, consisted of a diamond tiara, bandeau, stomacher, bow brooch, and bracelets. Double pearl necklaces came from her parents, while Prince Philip used diamonds from his mother‚Äôs tiara to design his bride-to-be‚Äôs engagement ring. 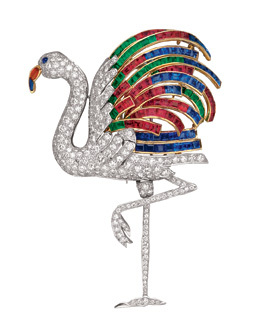 Flamingo brooch set with diamonds, rubies, sapphires, and emeralds. 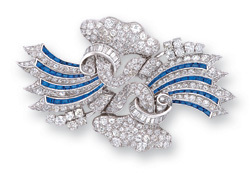 Diamond and sapphire double-clip brooch set in platinum, circa 1935. Embroiled in an infamous love affair with Edward VIII, the twice-divorced Wallis Simpson challenged the conventions of the time, toppled a kingdom, and altered the royal family‚Äôs line of succession. But she is just as famous for her love of fabulous jewellery. Besides the scandal it caused, the love story between this unlikely couple helped amass one of the most notable collections of the 20th century designed by some of the most illustrious houses of the day: Cartier, Harry Winston, Van Cleef & Arpels, and Suzanne Belperron. With her new title in hand, the Duchess of Windsor was named Time‚Äôs Woman of the Year in 1936 and she and the duke purchased pieces that we now term retro and avant-garde. Her wedding day photos clearly show the sapphire and diamond marriage contract bracelet on her wrist, jarretiere design from Van Cleef & Arpels, and a furling comets-style sapphire and diamond double-clip brooch worn centred high on the neckline of her pale blue crepe dress. In 1987, a year after her death, an auction of several hundred pieces raised millions for medical research group, the Pasteur Institute. One of the favourites in the collection was a flamboyant flamingo brooch set with diamonds, rubies, sapphires, emeralds, and citrines. In 2010, a single item-an onyx and diamond panther bracelet designed specifically for the duchess by Jean Toussaint from Cartier-sold at auction in London for $7 million. 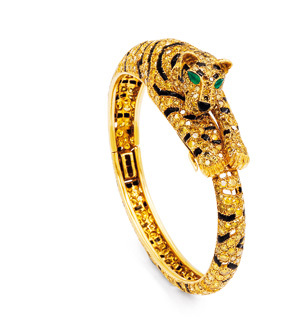 Made up mostly of pieces by Cartier, the entire 20-piece collection sold for $12.5 million. This fascinating love story has had a powerful impact on the world of jewellery collecting for more than three-quarters of a century. Prince Charles‚Äô choice of an engagement ring for his bride-to-be, Diana, created a minor scandal at the time. Although he purchased it from Garrard, an official jeweller to the royal family since 1843, the 18-carat oval Ceylon sapphire ring with 14 brilliant-cut diamonds was considered too common for a royal engagement. Today, the ‚ÄòLady Di‚Äô ring is probably one of the most recognizable styles on the planet. Now that it‚Äôs resurfaced with the engagement of her son, William, to Kate, the buzz is back and we may see a renewed interest in all things royal when it comes to jewellery. 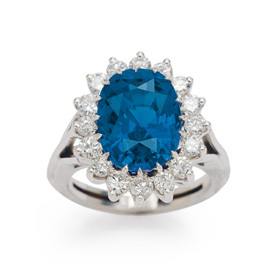 Sapphire and diamond ‘Lady Di’ style ring, set in 18-karat white gold. Yellow diamond, onyx and emerald bangle bracelet by Cartier. Prior to the July 1981 ceremony, Lady Diana Spencer received multiple wedding gift sets of sapphire and diamond parures from Middle Eastern potentates to complement the blue of her engagement ring. On her wedding day, however, she chose to wear family heirlooms, including the Spencer family diamond tiara. A lover‚Äôs knot pearl drop and diamond tiara‚Äìa wedding gift from her mother-in-law‚Äìis a treasure we may one day see on Kate. After all, a royal gal can never have too many tiaras. While designs, motifs, and trends keep evolving, some things will never really change as your clients follow the decorative links to the past when forming their futures. Recently, it‚Äôs been announced that Kate and William are coming to Canada post-honeymoon, so keep your eyes peeled for sighting of that iconic sapphire ring, real or facsimile. You‚Äôve still got time to practice your curtsy.